Rental £90 per night, minimum 14 nights including sales tax. Pool heat is not included..
4 bedroom, 3 bathroom villa with a very large spacious site and heated swimming pool. 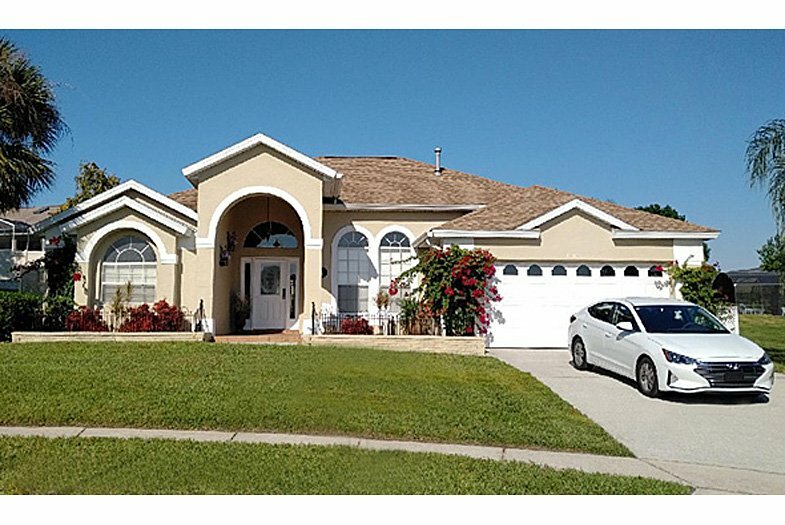 It is set in a private cul-de-sac approximately 10 minutes from the Disney attractions in Greater Groves about 2½ miles north of the US192/US27 intersection. The residential development is a mature area having a spacious feel with wide roadways, sidewalks and a community centre with children’s play area, tennis courts, volley ball, basketball and a full size community swimming pool. There are Super-Walmart and Publix supermarkets only 5 minutes away. Also Starbucks, McDonalds, Chillis, Red Lobster, Olive Garden... and major Golfing within easy driving distance. 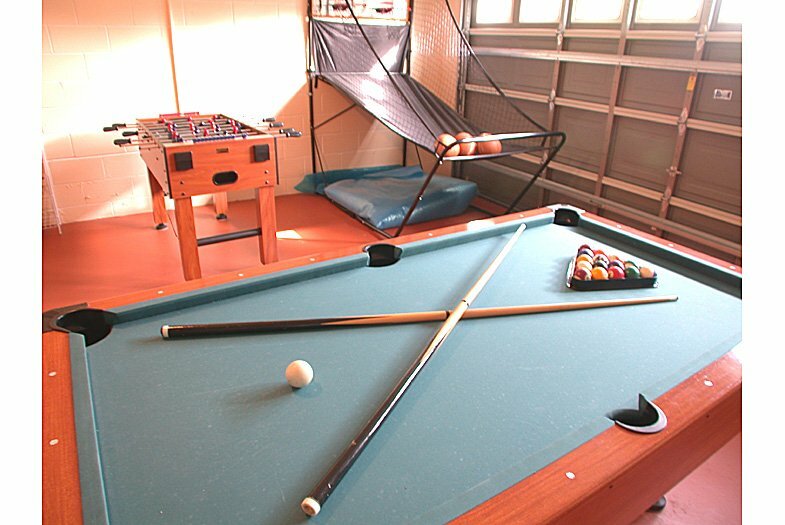 There are 2 king bed masters with en-suite… an extended 43ft x 43ft pool deck... an outdoor table tennis table… a fantastic games room… and FREE WiFi INTERNET for your smartphones / laptops / iPads. Where the rate shows '+ tax' alongside, then local taxes at 11% must be added to this price. Quoting US Dollar prices net of local taxes, is common place. Where '+ tax' is not shown alongside, then the prices already include local taxes. To estimate the price to rent this villa, enter the number of nights to stay and select the period which corresponds to your arrival date. Where there is a change of rate during your stay, this will not be factored into the price. If the everything looks ideal, don't forget to enquire about this villa. "We have just arrived and have entered the villa. 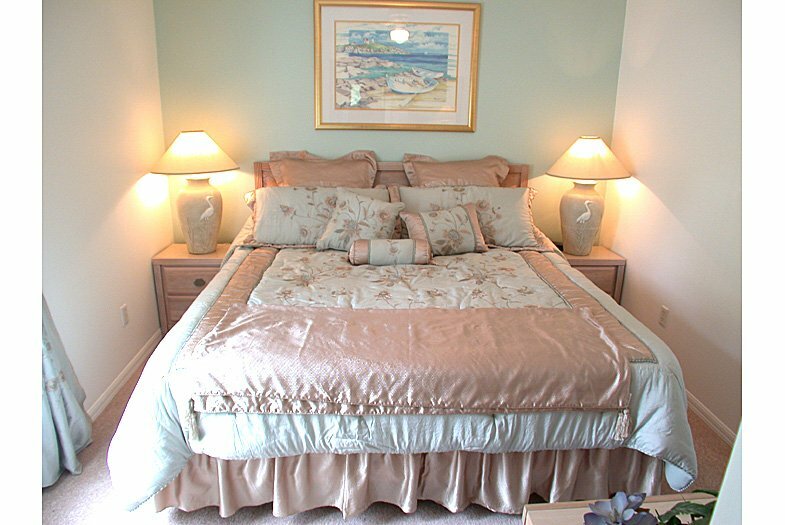 It is immaculate - a fantastic residence, which we will treat as if it was our own home for the month. Thank you for having it is such good condition." 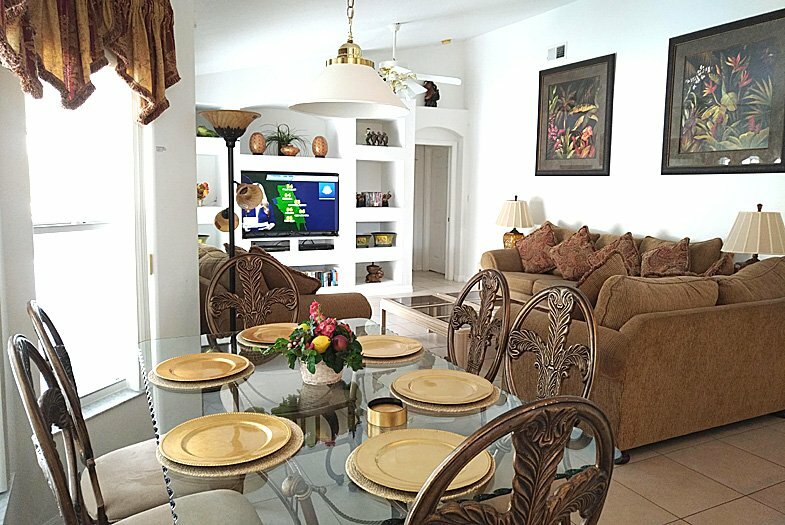 "We loved the location of your villa as it was close to everything that we love having access to... Disney, Publix and lovely restaurants, to mention but a few. Denis and Ann were lovely and very quick to respond, whenever we had the need to call them, please could you pass on our thanks to them?" "We arrived safely and your villa is fabulous! 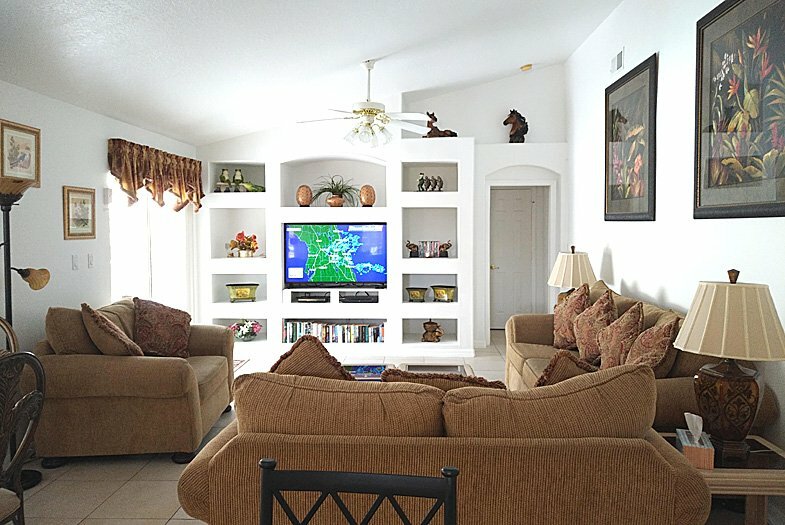 We're so fortunate to be able to spend our holiday in your lovely Florida home. Thanks for all your help along the way, it's been invaluable and we'll be sure to fill in your comments book before we leave." "We arrived safely yesterday and it's all good for us. We will have a ball!!" "Hi, just wanted to say thank you, we enjoyed our holiday in Florida and a big part of that is having somewhere really good to stay. 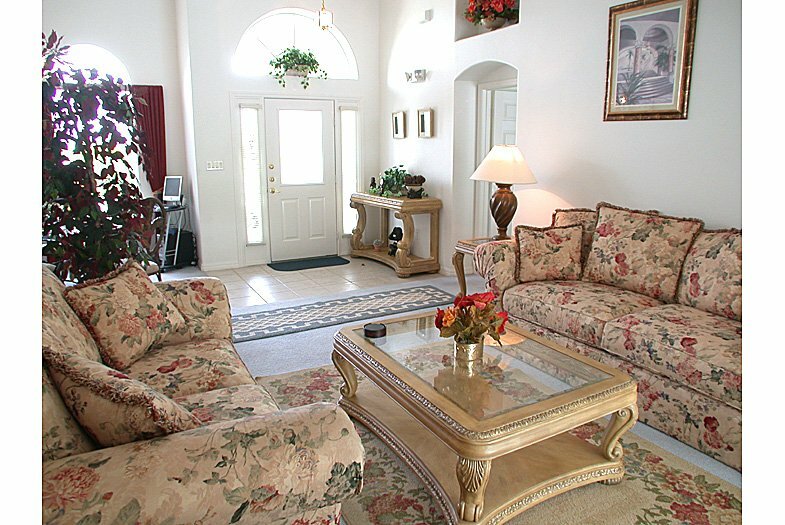 We loved your villa and are looking forward to our next visit." "Just wanted to say thank you for letting us stay here, it's an absolutely gorgeous villa and we're having a fantastic time. Louis wanted me to ask you if it's possible for us to live here please!" "We want to let you know that we have had a great time in your villa. What a beautiful house. We really enjoyed it. We are looking forward to coming back." "We are still in a happy holiday bubble! I just wanted to say thank you for a wonderful stay in your villa. It was the perfect holiday. Exhausting though! The villa had everything we could need and the beds were so comfortable we got a good nights sleep, which is really important." Unless otherwise stated, all prices are for 7 nights stay in the villa and INCLUDE the local sales tax. MARCH - SEPTEMBER at an additional £105 per week. OCTOBER - APRIL at an additional £140 per week. This is advisable between the months of October and April or ALL YEAR if you have young children and/or babies. A mandatory non-refundable Damage Warranty insurance payment of £60 is payable covering up to 800 USD accidental damage. Payment is via Bank Transfer or cash into our bank account. Arrival date can be any day of the week. For stays of more than 7 nights, all prices are calculated on a pro-rata basis. Discounts may be available on stays of 21 nights or more. All bookings are subject to the Owner’s Terms and Conditions. When travelling on US27, there is the busier section south of the US192 and the quieter north section. Greater Groves is approximately 2 miles north of the US192. As an established community, Greater Groves is a mixture of both residential and vacation homes and offers well maintained, spacious properties in a conservation area. For the active visitor, there are tennis courts, a large community pool (both accessible only by residents and guests), basketball courts and a children's play area. This combination of family friendliness and excellent properties makes it a popular choice with major UK tour operators. Golfers are in for a treat as well, considering the vast number of courses in the area - including the Lloyd Clifton designed Legends and Kings Ridge. Access through to Walt Disney World Resort has been improved, with the new western route - which means there is no need to join the mainstream traffic on US192. For Seaworld, Universal Studios and the International Drive area, Interstate 4 is likely to be your preferred route. Travelling around a mile south on US27 is the local Publix supermarket, with adjoining shops, a post-office, smaller supermarket and pizzeria. Carry on a little further towards the junction with highway US192 and there is a WalMart Supercenter. Adjacent to WalMart, there is a Blimpie Subs & Salad, Quiznos sub, Wendys, Taco Bell and a Chinese take-away. Should you need it, there is also a Lowe's electrical superstore on the other side of the road. For evening meals, a vast number of restaurants can be found on the US192 (towards Kissimmee), however, if you prefer to stay closer to home, there is a Red Lobster, Chilli's, Santa Fe, Sushi Bar, Devenney's Irish pub and a number of pizzerias. We have FREE high speed WiFi Internet access to allow you to check your web-based emails or browsing the Internet with your laptop / iPad / smartphones. You can have breakfast or a quick snack at the breakfast bar/nook area. The living area is for quiet reading or conversation etc... We have FREE high speed WiFi Internet access to allow you to check your web-based emails or browsing the Internet with your laptop / iPad / smartphones. 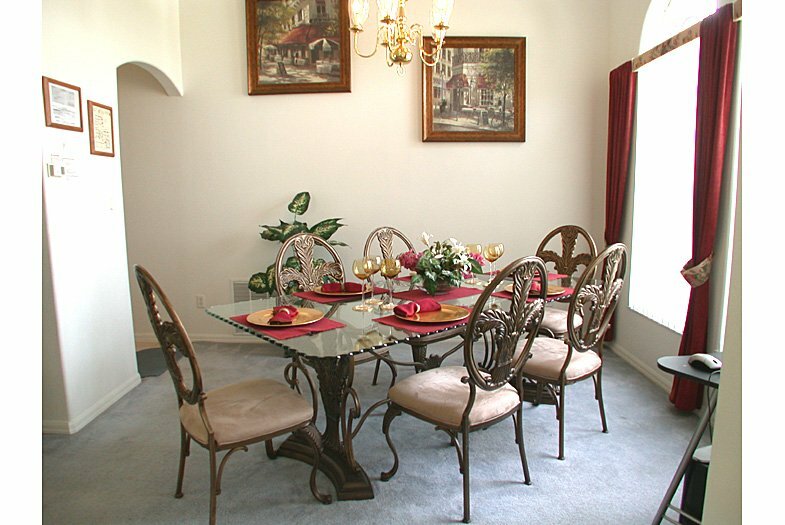 If you prefer you can have formal dining at the glass dining table which is next to the kitchen. 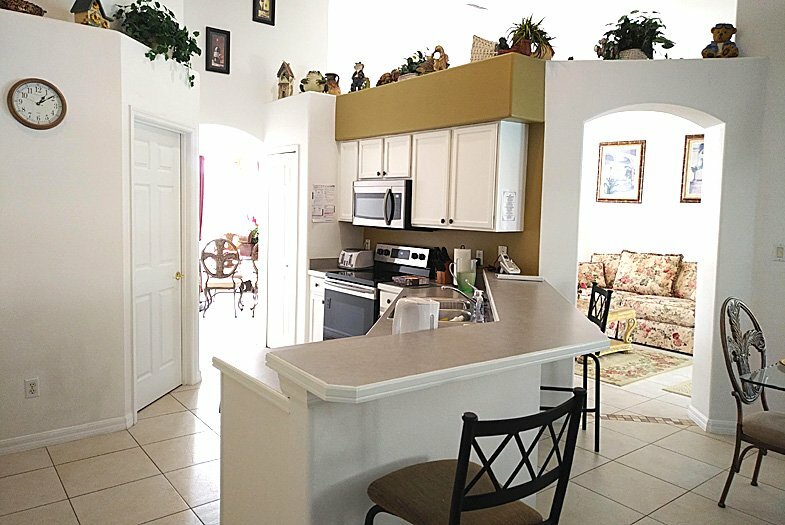 Should you wish to eat in, there is a fully-fitted kitchen, with all modern conveniences - including: large fridge freezer (with ice maker), dishwasher, large oven and microwave. All cutlery and crockery is provided. There are also laundry facilities include a washing-machine and dryer. 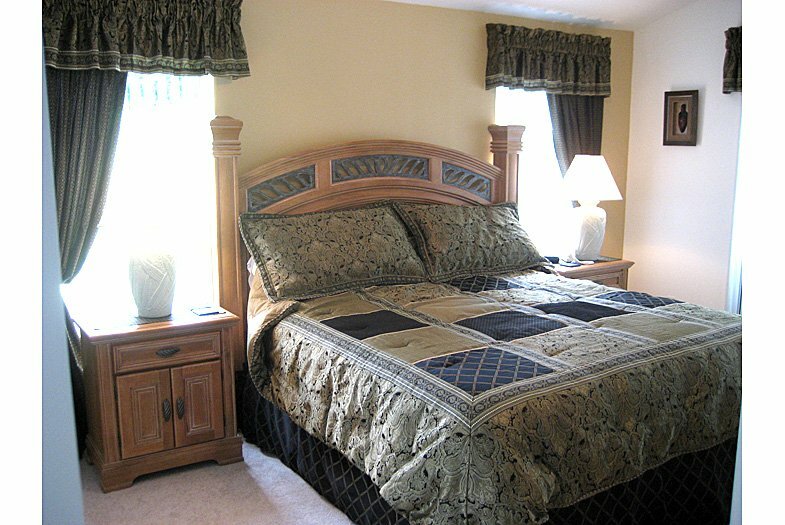 The bedrooms comprise the first master bedroom with superking bed and en-suite bathroom, the second master bedroom with a king bed and en-suite bathroom, the third bedroom has two twins (3’2 wide) and the fourth bedroom also has two twins but has linen to make up a king-size bed when both twins are placed together. There is a third bathroom shared by bedrooms 3 and 4. 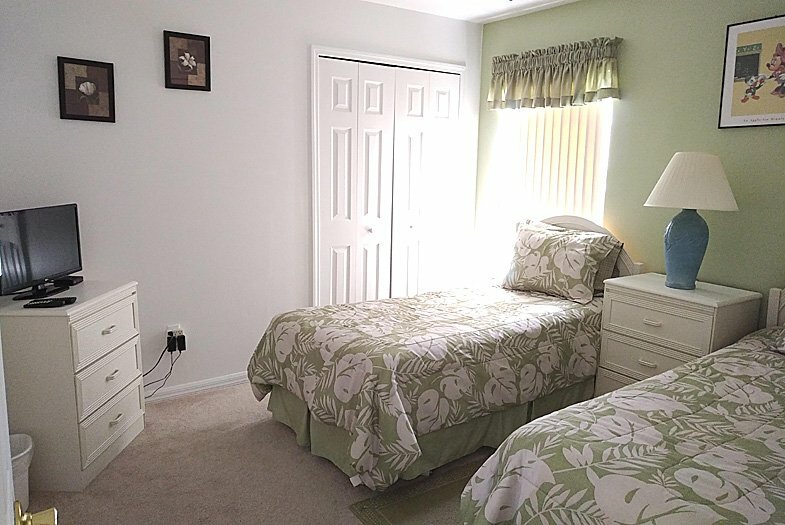 All bedrooms have ceiling fans as well as the air conditioning system to help you enjoy the environment. 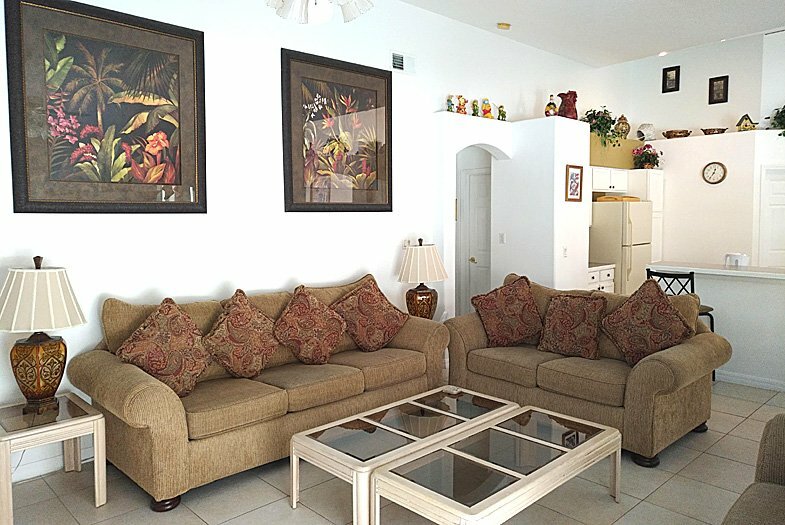 Flat screen televisions with Cable TV are available in all bedrooms. Spare linens and all towels are provided, but please bring your own beach towels for use at the beach and in the water parks. 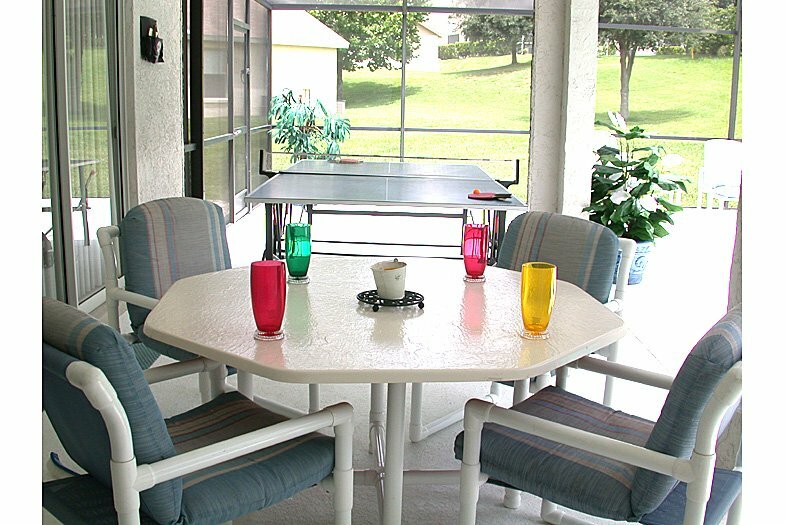 The outside oversized deck area offers covered lanai dining area, BBQ area, HUGE pool deck 43ft x 43ft, swimming pool 27ft x 15ft and an outdoor table tennis table. Luxury pool furniture includes five sun loungers, two reclining chairs with ottomans and two dining tables with chairs. This is an ideal spot for sun worshippers, but offers plenty of shade for those who need it. 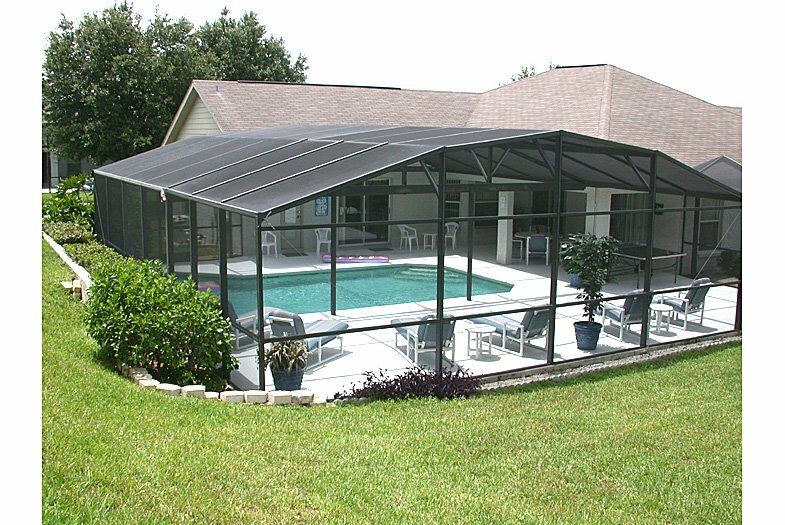 In accordance with Florida law, all patio doors that allow access to the pool area have child safety alarms. These ensure that small children cannot access the pool area without the assistance of an adult. It should be noted that diving is not allowed in the pool. We have a 7ft pool table, twin basketball shootout, foosball, dominos, cribbage, chess, checkers, rummy and playing cards. Here you or the kids can chill out and have fun... There is ample space to let you all use the equipment... but no arguing please !!! If you need any help with the equipment please let the Management Company know so that you can enjoy the facilities.